Momentum & Collisions | Cool Kid Facts . Momentum happens when anything is moving. Scientists call the object that is moving ‘mass’, and how fast the mass is moving is called ‘velocity”. Mass times velocity = momentum. If the mass is large, the momentum will also be large. If the velocity is great, then the momentum will also be great. And if the mass and the velocity are great, the momentum will be huge. For example, if a bulldozer is travelling slowly, the momentum will not be huge. But if the bulldozer is racing at 50 mph, the momentum will be huge. Which one of these has the greater momentum? A bowling ball, or a bulldozer travelling on a straight stretch of highway at the same speed? If you said the bulldozer, you are right. If the bulldozer was not moving, the bowling ball would have the greatest momentum because the bulldozer has to be moving to have any momentum. Collisions happen when things bump into each other when both things are moving and they exert a force on each other. For example, when a baseball is thrown and the batter hits the ball, both objects are moving and have momentum. Some collisions of two moving objects are accidents. Can you think of two examples? Remember that both objects have to be moving and the collision was not intended. Is a parked car hit by a passing car called a collision? The answer is no because one car is not moving. Can typing on a keyboard be called collisions? The answer is yes, because your fingers are moving and the key moves when you strike it. In any collision, the momentum change of the two objects is equal if they weigh the same and are moving at the same speed towards each other. They react in opposite directions. For example, if two moving things hit one other, one will go one way and the other will go the opposite direction. If the objects are moving towards each other and the objects are not the same size and weight or are not going at the same speed, one object will slow down and lose momentum when they collide and the other object will speed up and gain momentum. A force is anything that changes how an object moves; it can be a push or a pull. In order for a football to have momentum, it has to have some force acting on it in a certain direction, such as someone’s foot kicking it. Forces are in play whenever something moves and gravity is a force that is always present. Collisions can be seen in sports, such as football, baseball, golf, tennis, etc. If two football players running at the same speed collide, they will come to a stop on the ground. 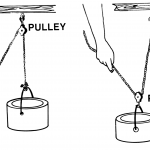 The heavier player (one with more mass) will force the other backwards because he has more momentum. What has to happen for a collision to occur? Momentum happens when anything is moving. Mass is the weight of an object. Velocity is the speed an object is moving. Two objects have to be moving towards each other for a collision to occur. Force is the energy used to make something move.